Guest Contributor Barbara Campbell Thomas / Journeying to Italy in order to bask in the perfectly toned muscular glow of High Renaissance art is a well-worn artist narrative. But while visiting Italy this past June, I bypassed the usual cast of characters entirely, taking in Florence mostly while dragging my luggage between the train station and bus terminal. Ultimately bound for a beautiful studio space at the Siena Art Institute, I came to Italy to draw and think, but also to locate an abstract painter’s alternate art history, one perfectly contoured to the needs of my own studio practice. Traversing centuries with ease and finding unexpected sustenance in viewing the conversant nature of contemplative space in paintings, mosaics, and performance art, I charted an entirely subjective course through the Italian cities of Siena, Bologna, Ravenna and Venice. 1. My starting point was a tiny painting located in Siena’s Pinacoteca Nazionale. Prior to June I had only viewed Castle by the Lake in reproduction, but the work’s vernacular abstraction has influenced my thoughts about painting for over fifteen years. 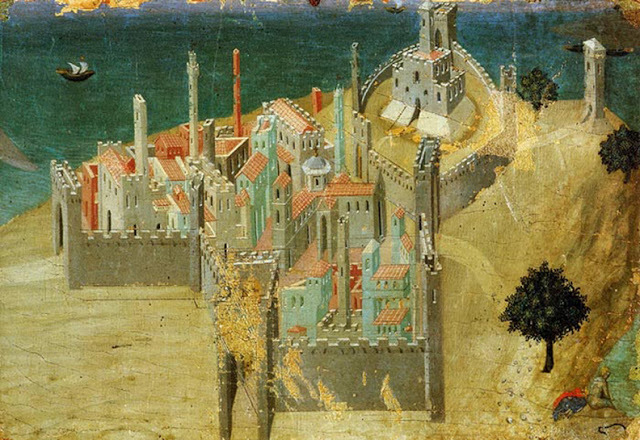 Attributed of late to Sassetta, Castle by the Lake has also been identified as an Ambrogio Lorenzetti work at times. The inability to conclusively ascribe it to anyone, and the fact that the work is effectively a fragment of a painting—having been cut out of an altarpiece—serve only to heighten the painting’s singular quality. While standing in front of Castle by the Lake I was struck by how palpably kinetic the painting felt. I could almost detect an open current running between the moment the painting was finished to the moment I inhabited. The expectant little boat, the arching, flat swath of lake/land, and a mountain in the foreground (that I can only describe as possessing a sense of humanity) all combined to unsettle my usual stance toward a painting. Few moments are as thrilling, or as disruptive, as when a painting reflects our own interiority back at us. 2. Sassetta’s City by the Sea (image at top) is about the same size as Castle by the Lake, is painted on a piece of wood possessing similar weighty depth, hangs just to the left, and is populated by seemingly the exact trees growing in its companion painting. Though I was not compelled to give City by the Sea similar amounts of attention, the naked figure sitting on the seashore in the bottom right hand side of the painting was a hard-to-ignore curiosity. A pile of clothing rests on the ground behind him. Is he just drying off after a swim? 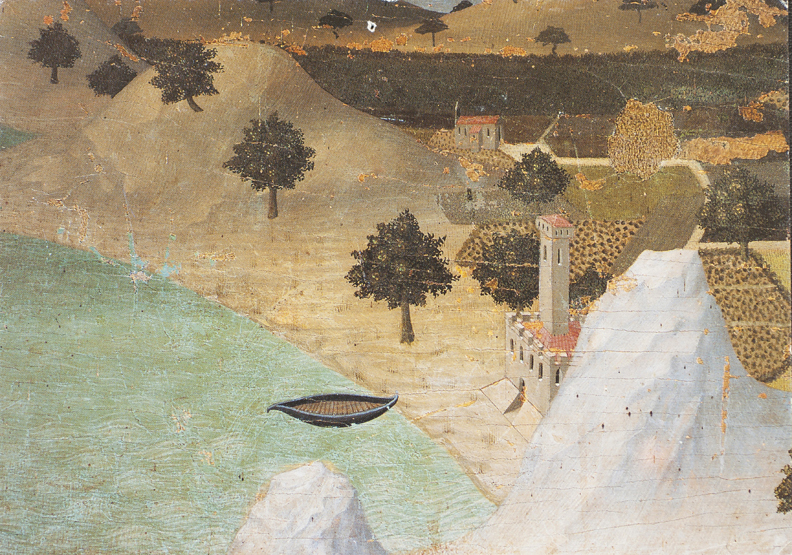 This kind of everyday detail arises often in Sienese painting, enough that I began making a list: a little cat walking across a balcony railing, a potted plant resting on a window sill, laundry hanging between two buildings, a tired student with chin in hand while listening to his teacher. Detail is seen when looking is slow; odd, idiosyncratic detail can be perceived when we enter intimate spaces—someone’s home for instance, or when we enter the incomparable realm of Sienese painting. 3. Within a week of arriving, I made my way north to the Byzantine mosaics of Ravenna. If Sienese painting showed me how abstraction could be a useful tool in drawing out a sense of empathetic intimacy in civic and domestic pictorial space, the Byzantine mosaics of Ravenna, particularly those found in the Basilica of San Vitale, exemplify abstraction’s adeptness in eliciting accessible contemplative space. 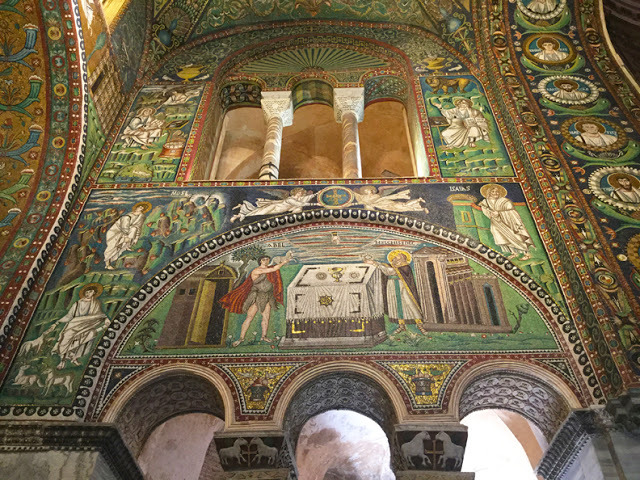 The church is notably unadorned save for its apse, and then the walls explode in an exuberant mix of color and light; mosaics cover every inch of surface above the altar, and are well above the viewers’ head. The San Vitale mosaics are meant for distance viewing, but even at a distance the eye can detect the undulating ground of complicated surface activity. The mosaic expanse fills the space, catalyzing the very air—to the point that talking and the ring of a cell phone feel aggressively loud. The mosaics of San Vitale are physical, material image operating as engulfing experience. 4. Bologna is a short distance from Ravenna, so a trip to the Morandi Museum was a given. With my head full of vast Byzantine mosaic space, I spent an afternoon leaning into Morandi’s focused universe of objects-as-painting. 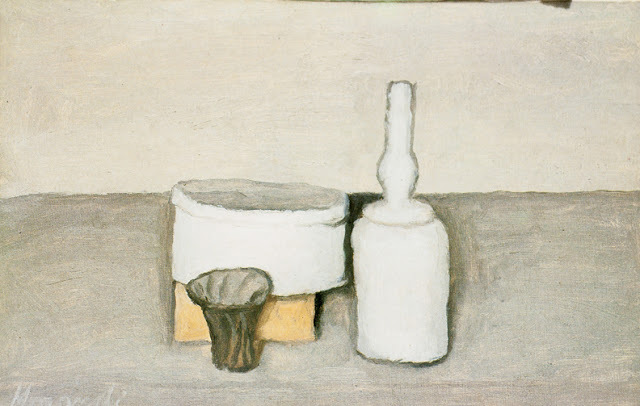 The juxtaposition did condition my Morandi looking; I could not help but fixate on the spaces between and around his menagerie of bottles, delighting in the endless ways his brush pressed in, compressed, and elasticized the settings. His objects felt scooped out of that inimitable Morandi air, but like a hand might scoop mud out of wet ground—his edges always staying in motion, ever opening and closing. 5. Quite honestly, I moved on to the Venice Biennale with trepidation. Knowing Das Kapital would be coursing through the hallways of the Arsenale induced a sense of dread. Thankfully I was mistaken, and despite being warned repeatedly about this supposed downer of a Biennale, I found quite a few transcendent moments. 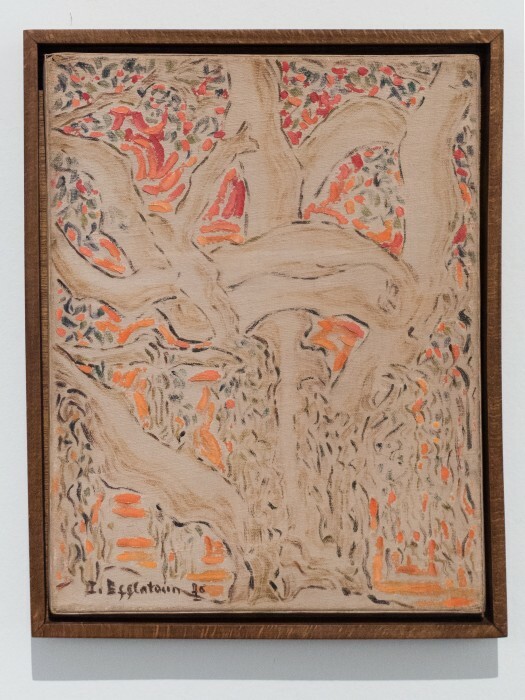 The first came in the form of Inji Efflatoun’s paintings. Having never heard nor seen the work of this Egyptian painter, I reveled in the discovery of her informal, lyrical brushwork. Not all the work was as resonant as Arum from 1976, but the fact that this feminist revolutionary spent four and a half years in prison and then chose to turn her attentions to quasi-visionary works of Egyptian landscape upended all kinds of expectations in my head. Imagine Laura Owens as a feminist revolutionary from the 1960’s, and you get a sense of why. 6. The next two entries are not images in the conventional sense, but as both art works figured prominently in my evolving month-long country-wandering consideration of how images induce presence or create contemplative space, they seem important to include. 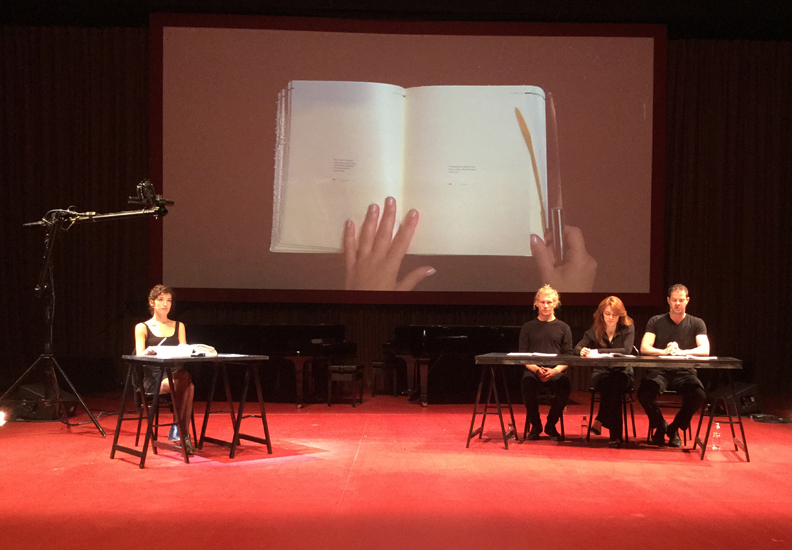 I sat in on a performance of Latent Images, Diary of a photographer in the Arsenale Central Pavilion, and as soon as I figured out what was going on, I was transfixed. Lebanese artists Joana Hadjithomas and Khalil Joreige created a 1300-page book transcribing hundreds of rolls of film of a Lebanese postcard photographer named Abdullah Farah. But Farah never had the money to process his film, so no images exist. Rather, he kept track of his photographs through a poetic diary in which each image on each roll of unprocessed film is described. His notes comprise the book made by Hadjithomas and Joreige, and I listened to a mesmerizing reading during which four performers brought Farah’s photographs to life via the sound of their voices. Words created images, and images gathered in my head, constructing a sobering, poignant description of daily life amid the chaos of the Lebanese civil war. Ernesto Ballesteros, Indoor Flights, 2015 from 16 Miles of String on Vimeo. 7. If Latent Images made the invisible visible through words, Argentine artist Ernesto Ballesteros in his performance Indoor Flights signified the invisible through physical action. I watched Ballesteros’s methodical, dance-like movements as he repeatedly retrieved and then set aloft one of his handmade ultralight planes. The slow flight of the plane literally drew the empty space, making air perceivable in ways that were baffling; I could not figure out what I was seeing for a time. Also, Ballesteros was cordoned off in a corner, and his slight separateness made me feel as though I was watching a series of incredibly intimate acts. When I happened upon him later, while I walked past the Arsenale cafe, he was eating a panino; I was immediately and inextricably embarrassed. 8. 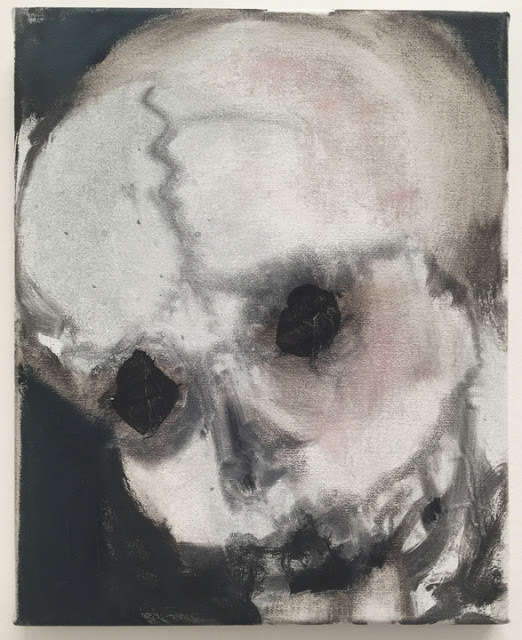 I found Marlene Dumas’s room of little skull paintings in the Biennale perversely enchanting. Whereas most of the paintings in evidence throughout the Biennale were big, polished statements of finesse (nothing wrong with that, mind you), Dumas’s collection of canvases felt like breathing—natural, sustaining, and possessing the capacity for greater expansion if paid attention to. I stood with her countless permutations of bony surface for a long time. Weirdly, the skull paintings seemed as though they could be a method by which Dumas keeps her hand fresh and open. Their painterly exuberance pits life against death in pictures that don’t ever fall fully into the macabre. 9. Domenico di Bartolo’s fresco paintings in Siena’s Hospital of Santa Maria della Scala completely surprised me. 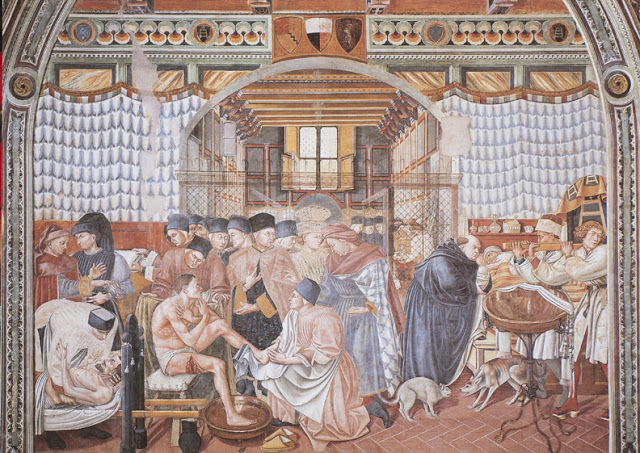 During its heyday in the fifteenth century, the “Spedale di Santa Maria della Scala” was viewed as a paragon of hospitals throughout Europe. To celebrate that fame, di Bartolo filled the hospital’s reception area with images glorifying its magnanimous care of Sienese citizens. The paintings are a treasure trove of vernacular detail, executed with an oddly distorted crystalline clarity. In my favorite of the group, I viewed hissing cats, comfortable bedroom slippers, and one of the most gaping thigh wounds ever depicted. 10. Of course there are many reasons to visit Florence, but the very best reason of all is to stand in front of Jacopo Pontormo’s Deposition from the Cross. While waiting for a train connection to Venice, I did take some time to make my way across Florence to its quieter side, the Oltrarno. After pushing through a sea of tourists on the Ponte Vecchio, the dark, cool and silent interior of the Church of Santa Felicita was a welcome world apart. 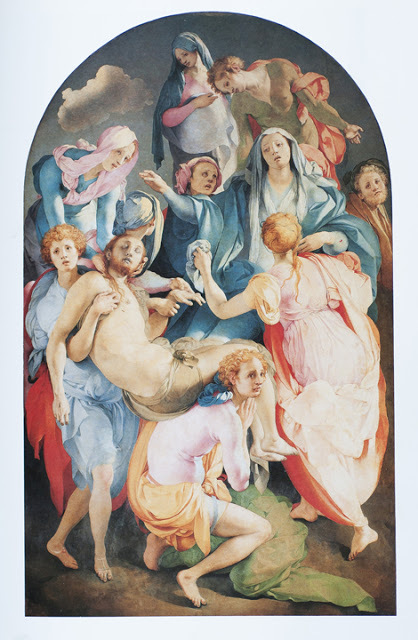 From numerous visits over the years, I know to let my eyes adjust for a moment before sliding a euro into the machine on the wall that will soon bathe Pontormo’s putty-colored, dead Christ with light. All the Technicolor pinks, blues, and oranges come to life then, and the sight is gasp-inducing. In Deposition, Pontormo’s abstraction lends Christ’s mother a billowing girth commensurate with her emanating grief. His particular sense of distortion also turns the skin of Christ’s attendant lovers alternately pink, green, and blue, and why not? Might our skin not do the same if we were carrying a soon-to-rise dead God? Deposition still sits in the chapel it was commissioned for, and for me, this fact has always lent the painting an intensity missing from many of the works housed in the infinitely more popular Uffizi. Editor’s note: Artists are welcome to submit ideas for future Ten Images columns to twocoatsofpaint@gmail.com. Please put “Ten Images” in the subject field. Thanks Betsey, such a compliment! Fantastic post. Barbara Campbell Thomas further enlivens these works with her descriptions and allows us, through her words, to see them anew, or in some cases, for the first time. Inspiring writing.